Paying tribute to one of Australia’s biggest pop / rock acts, this fabulous show performs all the hits that made INXS famous throughout the world during the Michael Hutchence era. Nothing is spared in terms of the scale and energy of the show. It is 100% live with a six piece-backing band featuring some of Australia’s very best musicians. INEXCESS …. It’s what you need. 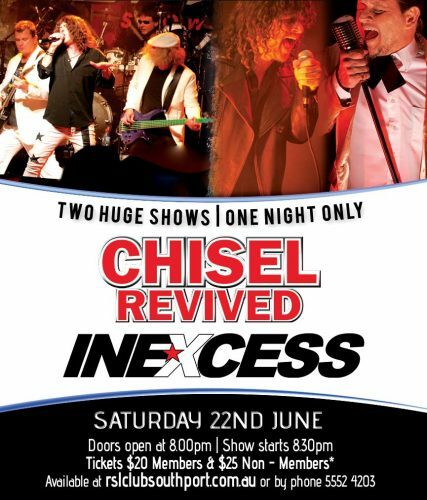 Is Australia’s number one Tribute to the Legends that are Cold Chisel & Jimmy Barnes. Chisel Revived perform all of the much-loved Iconic classics from Keh Shan, Choirgirl, Cheap Wine, My Baby all the way through to Bow River, when the war is over and Flame trees, this second to none show also features a huge cross section or Jimmy Barnes solo hits from the driving power of Working Class Man, Ride the night away, die to be with you tonight, also a featurette of R & B & swing of Higher and higher. All cleverly costumed representing those Iconic moments in Australian Rock History. Chisel Revived reproduce all these hits in a spectacular show fronted by one of the most gifted rock Vocalists in the Country, Tim Carter! So let’s Rock the Night away! Error: Error validating access token: Session has expired on Saturday, 02-Feb-19 17:58:11 PST. The current time is Saturday, 20-Apr-19 03:36:29 PDT.